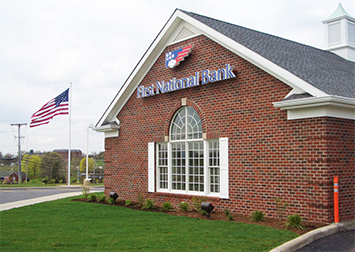 First National Bank in Bedford, Pennsylvania offers many services and products designed to make your life easier. Our dependable staff can assist you with all your consumer banking, commercial banking and wealth management needs. To learn more about our convenient banking solutions near you, visit us at 124 S Juliana St or give us a call today at 814-623-2101. This FNB branch in Bedford, PA is located at 124 S Juliana St and includes a 24-hour ATM for your banking convenience.Our friendly team members are happy to assist you during normal business hours. Or, for after-hours banking, you can use our ATM to make deposits, withdraw cash or check your balance. First National Bank was founded in 1864, and offers a full range of commercial banking, consumer banking and wealth management solutions. If you are coming from near St Clairsville, PA, head south on Main St/T542 toward Green Leaf Ln and turn left onto PA-869 E. Turn right onto the US-220 S/I-99 S ramp to Bedford. Merge onto I-99 S and continue for 6.8 miles. Continue onto US Hwy 220 S for 2.1 miles. Take the exit toward Bedford and turn right onto W Pitt St. After 0.8 miles turn right onto S Juliana St. Arrive at First National Bank (124 S Juliana St, Bedford, PA 15522). If you are coming from near Rainsburg, PA, head north on PA-326 N/Main Rd toward Cumberland St for 9.2 miles and turn left onto US-30 W. Use the middle lane to take the exit toward Bedford and continue straight onto E Pitt St. Make a slight left onto Lincoln Hwy/E Penn St and continue straight onto E Penn St. After 0.7 miles turn right onto S Juliana St. Arrive at First National Bank (124 S Juliana St, Bedford, PA 15522). If you are coming from near Everett, PA, head east on W Main St and turn right to merge onto US-30 W. After 5.5 miles use the middle lane to take the exit toward Bedford and continue straight onto E Pitt St. Make a slight left onto Lincoln Hwy/E Penn St and continue straight onto E Penn St. After 0.7 miles turn right onto S Juliana St. Arrive at First National Bank (124 S Juliana St, Bedford, PA 15522). If you are coming from near Manns Choice, PA, head northeast on PA-31 E/Allegheny Rd toward Chestnut St for 3.3 miles and make a slight right onto US-30 E. After 2.5 miles turn right onto Lake Rd. Turn left onto Lincoln Hwy and continue for 1.8 miles. Turn right onto S Juliana St. Arrive at First National Bank (124 S Juliana St, Bedford, PA 15522).